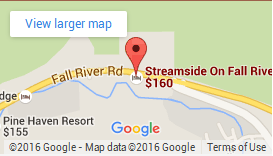 At Streamside we seek to create a fun, mountain environment in which to play or relax on your vacation. We are here to help you have the best vacation possible. Please reach out to the Front Desk if you have questions, need ideas for activities, need driving directions, or if we can help you book dinner reservations! Full kitchen: stove & oven, refrigerator, microwave, 8-cup coffee maker, dishwasher, dishes, glasses, silverware, pots & pans. Paper towels and dish towels. Kitchenette: mini refrigerator, microwave, coffee maker. Ceiling fan and skylights in select units. In-room massage services: contact the Front Desk to schedule an in-room massage or to schedule services at a local spa. Complimentary DVD library: peruse the large list of available DVDs in your guest directory, then stop by the Front Desk to pick them up!